[PDF] The Happy Lawyer: Making a Good Life in the Law | Free eBooks Download - EBOOKEE! Description: You get good grades in college, pay a small fortune to put yourself through law school, study hard to pass the bar exam, and finally land a high-paying job in a prestigious firm. You're happy, right? Not really. Oh, it beats laying asphalt, but after all your hard work, you expected more from your job. What gives? 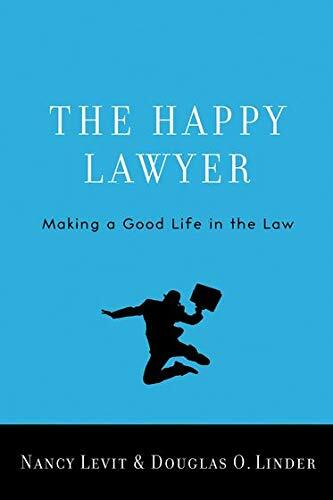 The Happy Lawyer examines the causes of dissatisfaction among lawyers, and then charts possible paths to happier and more fulfilling careers in law. Eschewing a one-size-fits-all approach, it shows how maximizing our chances for achieving happiness depends on understanding our own personality types, values, strengths, and interests. Covering everything from brain chemistry and the science of happiness to the workings of the modern law firm, Nancy Levit and Doug Linder provide invaluable insights for both aspiring and working lawyers. For law students, they offer surprising suggestions for selecting a law school that maximizes your long-term happiness prospects. For those about to embark on a legal career, they tell you what happiness research says about which potential jobs hold the most promise. For working lawyers, they offer a handy toolboxâ€“a set of easily understandable stepsâ€“that can boost career happiness. Finally, for firm managers, they offer a range of approaches for remaking a firm into a more satisfying workplace. Read this book and you will know whether you are more likely to be a happy lawyer at age 30 or age 60, why you can tell a lot about a firm from looking at its walls and windows, whether a 10 percent raise or a new office with a view does more for your happiness, and whether the happiness prospects are better in large or small firms. No book can guarantee a happier career, but for lawyers of all ages and stripes, The Happy Lawyer may give you your best shot. No comments for "[PDF] The Happy Lawyer: Making a Good Life in the Law".